Dolphin 4, beachfront 3 bed room duplex apartment over 2nd and 3rd floors with 2 balconies and a French terrace. This luxury apartment is at the very front of the complex overlooking one of the many pools and the private beach. 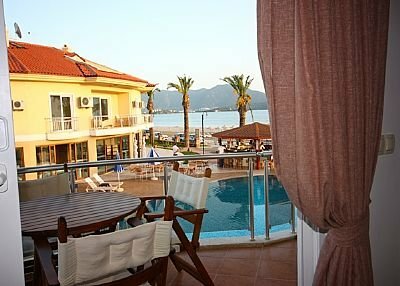 The sea views across Fethiye's island strewn bay are magical day or night. Entrance Floor: You have a long corridor with plenty of storage space open plan kitchen / dining / living room which leads out to your spacious balcony where you will eat and drink. Family size bathroom, master bedroom with French terrace and satellite TV, at rear but still with sea and beach views you have a twin bedroom.